With 25 years experience in communications design and over a decade of experience in interactive design, Brooks Cole is the founder and creative force behind HoloCosmos  a wisdom circle of media magicians at the cutting-edge of human-computer interaction. 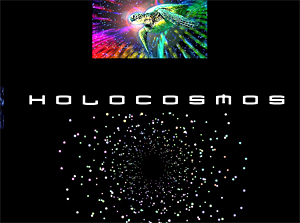 The notion of “HoloCosmos” is that the superset of the macrocosm, microcosm, infocosm and mythocosm is a unified knowledge universe which can be made navigable and explorable with sufficiently advanced digital media technology. Brooks is an electrifying presenter, speaker and advocate of the potential of emerging forms of dynamic, immersive networked Knowledge Media to empower individuals and organizations and effect positive change in business, education, society and environment. His highly visual presentations combine groundbreaking media projects with prototypes which provide windows into the future of digital media technology. With HoloCosmos, he has continued to expand his expertise in information architecture, visual design, interface innovation and conceptual innovation for Fortune 500 giants like Time-Warner, GE and many of its divisions, as well as fast-growth companies, non-profit organizations and individuals. Recent examples include: Event theming for the Time Warner Global Leadership Conference; NewsFlash: the Flash Communication System created originally for GE Capital, and now used by GE Commercial Finance, GE Consumer Finance, GE Real Estate Europe, and many others; entertainment design and interface design for QMSE’s Enabler and Synergy Media’s TouchStand; web and web application development for NewsFlashServer, Backweb Technologies, NetTV, TV-Centric Media-On-Demand interface development for Lumenati, OnNet Corporation, and Sonic Solutions; site and membership marketing design for The Institute of Noetic Sciences; identity, web and marketing design for Stripped Women’s Fitness Studios; media package design for Enlightenment.com/ Ken Wilber, intranet design for GE and Barclay’s Global Investors; web design for author George Dalzell, Immunology Lecturer Sondra Barrett, PhD., and many other clients. He acts as Creative Director for CivicActions, with whom he has developed information and visual design solutions for The Institute of Noetic Sciences, New Progressive Coalition, Leveraging Investments in Creativity, Open Network, Campaign for California’s Future, WisdomSpace and TrueDemocracy. Roots in Theory: While studying Marketing and Design at the University of Denver as a Boettcher Scholar, Brooks developed a new theory of human perception called “MindSphere” that presaged current developments in digital media, virtual reality and knowledge navigation, and has applied this theory to advances in interactive television, interface design, information architecture, learning systems, and a ground-breaking patent in the Visual Navigation of Information Objects. In 1981, Brooks founded WBC Communication Design to serve clients in Financial, Healthcare, Hotels, Manufacturing and other industries. Brooks formed MindSphere, a leading Bay Area interactive media developer, in 1993 to implement his vision and apply his principles to the service of clients, providing them with new ways to communicate, conduct business, entertain and learn interactively. MindSphere assisted numerous businesses in the deployment of commerce, entertainment, and knowledge-sharing solutions, including Hewlett-Packard (17-site web system for three divisions), TV Guide OnScreen (ITV Electronic Program Guide), Microsoft (Broadband ITV Navigator for kids), Macromedia (Package and collateral design, interactive tradeshow demos), SGI/Time-Warner (ITV user testing applications), Oracle (ITV consulting, CD-ROM design and animation), VLSI Technology (web system redesign and standards), LSI Logic (web system redesign and standards), 3Com (web system redesign and standards, interface for 3Com Park Touchscreen Kiosks), MS2 (web application interface design, web system design, branding, collateral, promotions), Intuit (interactive product demos), and DIVA Systems (ITV network navigator, architecture, branding, promotions). Brooks believes that the future Web 3.0 is about “HoloConvergence”, the stitching together of all information objects (data, metadata, media, people, groups, organizations, places, events, transactions, devices and contexts) into a single multidimensional, navigable whole. And he’s got the math, the know-how and the team to pull it off. In 1999 Brooks was awarded a groundbreaking U.S. Patent on the “Visual Navigation of Information Objects”, is developing several related new ones, and has assembled a team of mathematicians, engineers and artists to develop frameworks for the next generation of knowledge navigation applications, user interface paradigms, media handling tools, systems and content applications to discern, track and model user intent and make interactive media more meaningful and relevant. His areas of development include “HoloLearning” an electronic curriculum standard combining realtime online interaction, 3D game-like navigation and DVD/Streaming digital video; a VR knowledge finder for dynamic navigation of spatial information arrays; a 3D Music Universe Navigator for exploring dimensional relationships and affinities for the ultimate navigable music universe; an augmented geospatial data navigator; a navigator for historical and time-based information as an explorable landscape; and an engine for the delivery of dynamically edited and composited “MetaMedia” fashioned on-the-fly from multiple media types and sources.